It is time the Army be swapped with IAS/IPS to Border areas (J&K) and they occupy the positions in States/Centre in IAS/IPS/GpA posts. At least for next five years. The borders will be secure with IAS/IPS/GpA etc and the national administration WILL be improved by 200%. The country will be safe internally and externally. Please read the article now. As the security vacuum in South Kashmir deepens and azaadi (freedom) appears to be a real possibility to giddy crowds of stone-pelting youngsters, security establishments in Srinagar and New Delhi have begun contemplating the use of armed force to regain control of the Valley. While hoping that political initiatives, such as the all-party parliamentarians outreach earlier this week, gain traction and calm tempers, senior police, intelligence and army officials are contemplating the contingency that they fail. 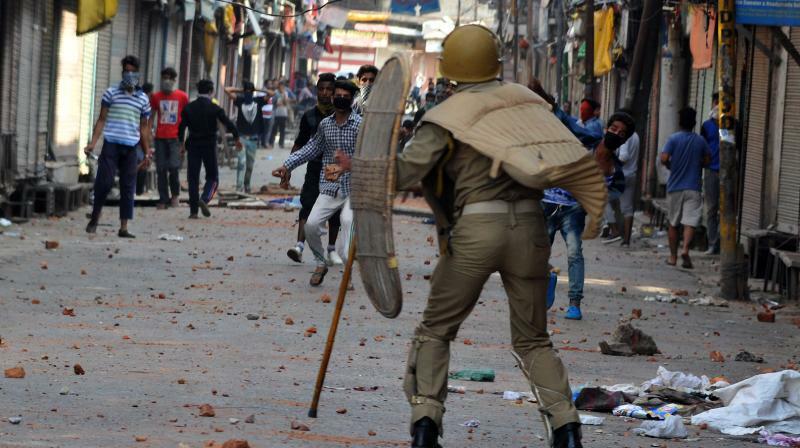 Influential officials in Srinagar argue that permitting large, impassioned crowds to gather everyday, shout anti-India slogans and use force, especially against the embattled Jammu & Kashmir (J&K) Police, are creating a dangerous momentum towards anarchy. “Sooner or later, we will have to retake control in South Kashmir. The longer we wait, the more emboldened the protesters become, the more force will be required to deal with them”, an official told Business Standard. When it was pointed out that a bloodbath would make the situation worse, the official opined there would not be much resistance to a determined security forces operation. “A month later, resistance would be heavier; and a month after that, it could be a bloodbath”, he said. Both police and military officers concede that only the army seems capable of confronting the violent mobs. However, generals are loath to be involved in what commanders term “a law and order situation”. Senior army commanders, including Lt Gen DS Hooda, the top army commander in J&K, signalled early in the agitation that the conflagration required political management, rather than treating it as a security problem. This has always been the army’s worst scenario --- the failure or abdication of political engagement, leading to the large-scale use of force. During two months of almost daily violent protests since the July 8 killing of the Hizbul Mujahideen (HM) militant group’s South Kashmir commander, Burhan Wani, in an encounter near Kokarnag, violent protesters have operated unchecked over large areas south of Srinagar. After initially killing tens and wounding hundreds of violent protesters, many of whom were frontally assaulting police stations, the J&K Police has melted away. The army too has adopted a low-key, non-provocative profile. Security managers had initially assumed that, in time-honoured Kashmiri manner, the cooling of anger over a few days of tight curfew, and an end to heavy-handed means --- in this episode, the indiscriminate use of pellet guns --- would restore normalcy. However, two months have elapsed and, earlier this week, separatist leaders rebuffed an all-party delegation of parliamentarians that travelled to Srinagar and tried in vain to break the deadlock. After snubbing New Delhi’s political outreach, the Hurriyat Conference leadership, currently dominated by Syed Ali Shah Geelani, continues to issue “protest calendars” that lay down an agenda for daily protests. Police officials, meanwhile, worry about the possibility of a serious provocation from the protesters unleashing savage retaliation from the J&K Police, or the Central Reserve Policy Force (CRPF), both of which are in frequent running confrontations with protesters while enforcing the curfew. “A conflagration is waiting to happen. Sooner or later, some youngster will break and we will have another Gawkadal on our hands”, says a top police officer. The reference is to a confrontation in 1990 between a CRPF detachment deployed on the Gawkadal Bridge in Srinagar, which opened fire after it was attacked by stone-pelting local residents. An estimated 50 locals were killed in that widely-condemned incident. While the all-party parliamentarians’ delegation has recommended continued political engagement, including with the separatist leadership, the members of parliament (MPs) have also come back with a greater awareness of the seriousness of the challenge in the Valley. This was evident in their engagement with Prime Minister Narendra Modi on Wednesday. Beyond the obvious challenge of violent protests, intelligence and police agencies in Kashmir have briefed the MPs about growing radicalisation, growing acceptance of the Islamic State ideology, increased infiltration of militants across the Line of Control, and the almost fervent embrace of these fighters by a local populace that was earlier wary of direct association with militants. Situatin in the valley is real bad. Its real test of a leadership. Ornamental talks on television and brave paper statements are not going to work.its a test of nerves and resolve. Lets see who does it.Ofc course defence forces will never disappoint ever..aboit rest i cant say. Its time political masters be told try out CPAF with all the AFSPA given to them. Let us see the IPS and all the babus leadership and professional capabilities and the 7th CPC Judge be made the the head where he can hone all his equivalent theories. The best person to relieve the situation is Sh. Ashok Mathur. The situation in Kahsmir is not so 'complex" after all as portrayed.Otherwise he could have easily handled it with his few trusted IAS and IPS, the only persons capable of dealing with such "complex" situations, if made Governor, at least as a reward for giving the most "historic" slighting report for the lambs and a certain Rathin Roy would not dare ask Sh. Ajai Shukla on NDTV "how much would be enough for you(sic. forces)". Still fools rush in where angels fear to tread at the preknown risk of alienation again and the leader of the simple and "uncomplex" lambs tells the lambs "there is no alternative than getting you sacrificed but I cannot get anything for you in return bargain even when placed in most favourable situation for your welfare because my chair, post retirement welfare and possible future plum posting "always and everytime come before you" and are worth enough for you to be sacrificed and so RIP ever after the sacrifice because that is your reward in death if not in life"
IAS/IPS/7th CPC Chairman and members be asked to man Border Out Posts with BSF/CRPF/ITBP/CAPF and Army to do internal security duties since CAPF has been put equal to Army in Pay & Allowances and status. Any covert move by the Babudom to 'hand over' the sit to Army must be firmly rejected by the Army commanders at all levels. Massive force levels of well trained BSF/CRPF/ITBP/CAPF etc available with the Govt led by the IPS/cadre officers & under the able Adm guidance of Babus must be tasked to sort out this not so complex a problem.The operation must be planned & executed by their own force HQs/NSA.All those who fail to achieve assigned objectives must be sacked/dismissed from service & severely punished.Sheer quantum of force level should result in overall success,though the ops may be prolonged over several yrs. Army may only step in after ALL these forces have been defeated & the entire operation has failed with heavy casualties.Only then can the sit be considered not in control of civil adm & they can demand army help.